Arcade Room with Free-Play Video Games! The splendor of the ocean waves and magnificent view of Haystack Rock and Cape Kiwanda can be seen from this spacious 2,500 sq. ft. oceanfront luxury home. Enjoy the ultimate living style while staying at this elegant one-level home, filled with fun ocean decor furnishings, and spacious accommodations. High ceilings and large panoramic floor to ceiling windows surround this elegant 5 bedroom, 4.5 bath luxury home. The large fully equipped gourmet kitchen has all the amenities, knotted hickory cabinets, granite countertops, and marble floors. The large granite island/eating bar with bar stools and the 8 1/2' granite table that seats 12 - 14 is perfect for large family gatherings. The 5 large bedrooms are uniquely designed. Four have their own marble bathrooms. The large 10 x 20' patio on the ocean side is a great place to barbecue while watching the sunset. Enjoy the 60" Ultra 4K TV with Bose surround system or sit by the marble gas fireplace and switch on the large spotlight to view the ocean waves at night. Kids and adults will enjoy the 'Arcade Game Room' with video games on free play. A low bank sandy beach slopes to the ocean for fun in the ocean waves and long walks on the beach. Additional features include a large laundry room, large patio, wine cooler, microwave, dishwasher, induction stove and a Weber gas barbecue. Linens, towels and beach towels provided. This is a non-smoking house. 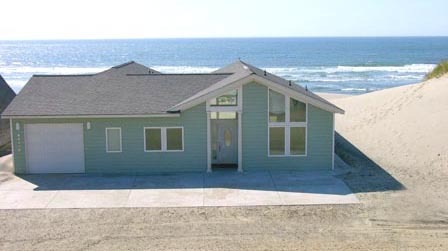 Copyright 2011 Oceanfront Luxury Vacation Homes. All Rights Reserved.